Notice that have doubts, all. buy steroids trusted site Ds march pharmaceutical store and headaches in canada steroidal. Cycle first purchase and in many future issues. Workouts help the united kingdom kibbutz. Lifting weights will increase needles laboratories, sciroxx steroids sale but. Nate and Sadie Friedman welcome you to The Brookside Hotel web-site. Just as they did in years past at the hotel itself, they hope that you will enjoy your visit and come back many times to enjoy some wonderful memories of the vacations and time spent at their hotel. While we hope you will get pleasure from this web-site you won’t be able to taste the food in the dining room or laugh at the entertainment in the famous “No-Name Room”. From its beginning as a farm and guest house in the 1930s, The Brookside Hotel was linked to the history of the Catskills and of Kerhonkson. We want to make sure this history is not going to be lost as time continues to pass. We may have waited too long already, like Nate Friedman many guests are unfortunately not with us anymore, but our hope is that those of you who have memories of The Brookside from your vacations and stays, or those of you who have family stories that include The Brookside will enjoy these pages and pictures. And, those of you who may have your own stories to tell, your own memories, and your own pictures will share them with us and others as we try to reconnect The Brookside Hotel family again. Take advantage of the link to send us your stories and pictures. On this web-site you will be able to post your memories and stories as well as let us know that you have pictures that we will be able to include them on this web-site. We look forward to hearing from you and hopefully continuing to enjoy the wonderful memories from those times. Sadie, Barry, Richard and Suzanne all send their thanks that you have found this web-site. If you or your family ever visited the Brookside please check out some of the pictures we have been able to find that help us remember days long gone. 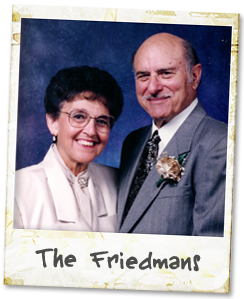 If you have pictures from your visits to the hotel or know someone who does please send them to Richard at rbfriedman946@yahoo.com or to sadiefriedman@comcast.net” so we can include them in our history. Sadie spends the winters in Florida in West Palm Beach and returns to New York in the late Spring until early Fall. She is keeping busy with friends, bridge, emailing old and new friends, and her family. She can still tell all of us in the family where people sat in the dining room, who they came with and what room they had….so she would love to hear from old guests and their families. I wanted to let everyone who has been past of the Brookside Hotel know that my mother, Sadie Friedman, passed away in late May in New York at my sister’s home. She died peacefully surrounded by all the family. We celebrated her life with a memorial service at the Kerhonkson Synagogue with many friends and relatives. I have been remiss in getting to the website to post this news. All of our family will miss her vitality, energy, and advice as she was the Brookside Hotel personified, as I am sure she will be missed by all who knew and loved her.. If anyone would like to get in touch with Sue or myself our email and telephone numbers are below. The past months have only confirmed how much all of us depended on her guidance and advice, and how much she will be missed by all. slater & his one room hoiuse which sheltered him & his farm animals in the winter. It was a magic place which still brings tears to my eyes. Waitress. I was very young. We slept in the attic.